It’s not that I don’t like moustaches. “Free moustache rides” is still one of my favourite lines ever. And I can totally get behind publicizing men’s health issues. (The statistics are shocking, especially in mental health and suicide.) But there are two big reasons I don’t do Movember: I don’t want to unwittingly promote controversial cancer screening to the male masses, nor do I wish to be a cause-marketing dupe for companies (and industries) that do not reflect my values. The key message that I hear from Movember is that men (ALL men) need to get themselves to the doctor for P.S.A. testing as soon as possible. This is the Movember rallying cry that gets amplified through their moustachio’d membership. “Get tested — early detection saves lives!” is the soundbite bouncing across Facebook, Twitter and throughout offices and workplaces. The belief behind this micro-message is that P.S.A. testing is an unequivocal success when it comes to saving lives. Statistics for the effects of P.S.A. testing are often represented this way — only in terms of possible benefit. But Newman says that to completely convey the P.S.A. screening story, you have to extend the metaphor. After handing out the pills, the man in the white coat randomly shoots one of the 17 men dead. Then he shoots 10 more in the groin, leaving them impotent or incontinent. Newman pauses. “Now would you open that door?” He argues that the only way to measure any screening test or treatment accurately is to examine overall mortality. That means researchers must look not just at the number of deaths from the disease, but also at the number of deaths caused by treatment. So why is Movember apparently choosing to ignore the science and continue the “early detection saves lives” rhetoric? In a charitable mood, I might say it’s complicated. That it’s an emotional issue and those emotions cloud reason. We want to believe there’s a simple test that will go a long way to saving the lives of the men we love. And P.S.A. testing clearly does save lives. It’s just that it also claims them. It’s a matter of emphasis. But that isn’t how the issue is framed for Movember. If I was feeling cynical, I might say that at a board level it isn’t complicated at all. Cancer screening is big money. It’s the top of the sales funnel for the cancer-treatment industry, which includes medical trade organizations like The American Urological Association as well the drug companies that are always looking to grow their market. When men are tested en masse, many of those men will be treated (whether they need it or not.) From this perspective, Movember, with its staunch pro-P.S.A. stance, is at risk of appearing like a PR arm for the cancer biz. Movember also acts as a cause-marketing juggernaut for some very big companies, some of which have dubious connections to the cause. Schick, for example, an international company that markets razors and skin care products, advertises on the Movember Canada website. While the Environmental Working Group (EWG) provides an online cosmetics database where consumers can research the health hazards of common ingredients in personal-care products, many of the chemical ingredients in personal care products are unregulated and are not listed on packages, despite scientifically backed concerns about exposure. One of the main concerns that shows up again and again? Cancer. Movember reminds me a lot of the pink-ribbon campaign for breast cancer, right down to the screening controversies and questionable corporate ties. This is probably no accident. Movember appears to be modeled after Pink Ribbon. But unlike the Pink Ribbon campaign, which has earned its fair number of critically thinking detractors, critics of Movember are virtually impossible to find … so far. Pinkwashing critics point to the cozy relationships between cancer “awareness” groups and for-profit screening and treatment providers, as well as the corporate sponsorship of pink-ribbon campaigns by companies that sell harmful (carcinogenic) products. Company/industry makes products implicated in cancer. Company/industry launches or funds “cause-marketing” campaign to align itself with finding a “cure” for cancer. Companies that sell products containing known or suspected carcinogens are some of the biggest supporters of pink ribbon “breast cancer awareness” campaigns. In fact, if you decide to dig beneath the surface, you might be shocked. The question begs to be asked: “If you care so much about protecting women from breast cancer, why don’t you stop selling products that are implicated in causing it?” Or, why is the search for a cure brought to you by the cause! The same question arose in my mind when I clicked through a link on the Movember Canada website and discovered that Prostate Cancer Canada was “founded in 1994 by Ron Evason, who at that time was the President of the Society of the Plastics Industry (SPI) of Canada.” I wonder if Evason, who was diagnosed with prostate cancer in 1993, ever questioned the role that the plastics industry might play in the rise of cancer. You don’t need to be an industry insider to understand that the role of an organization like SPI is to promote the interests of the plastics industry. And you don’t need to be a natural health maverick to fathom that those interests may sometimes be at odds with the health of Canadian citizens. In fact, the plastics industry increasingly finds itself at the wrong end of health research showing links between reproductive cancers (i.e. – breast, prostate, testicular) and the chemicals (like bisphenol A, or BPA, and phthalates) that the industry produces. Then there’s the issue of the deafening silence of all that Movember omits. How much of their message is dedicated to encouraging lifestyles that we know help to prevent cancer? How committed are they to getting men off their asses and exercising, not just getting to the doctor for screening? How about eating fresh vegetables (preferably that haven’t been poisoned with corporate pesticides)? Where is Movember’s link to the Environmental Working Group’s website? Or their petition to get industrial toxins out of our water, food and air? Where is their support of the precautionary principle when it comes to cancer? I don’t mean to suggest that lifestyle alone will end cancer, or that screening is useless, or that research isn’t valuable. But we need to see the issues in perspective. 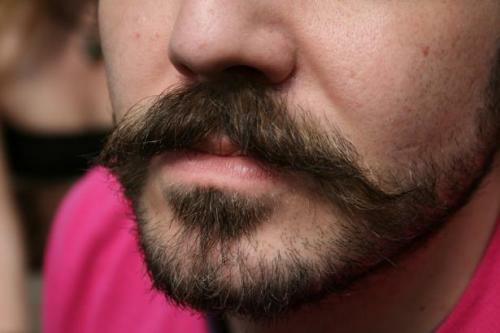 And frankly, I think Movember does a disservice in this regard. I notice that I’m perspiring as I write this. I know that my friends participating in Movember are well-intentioned; good people with strong values. I also know that I’ll get lots of pitches this season for supporting Movember. And I know that I’ll have some explaining to do when I say no. Hopefully this article will help. Justice Marshall writes for the Vancouver Observer. This article was reprinted with their permission. Please donate to Prevent Cancer Now today. We need you more than ever! Confused? Don’t be. Organic food IS better for you! 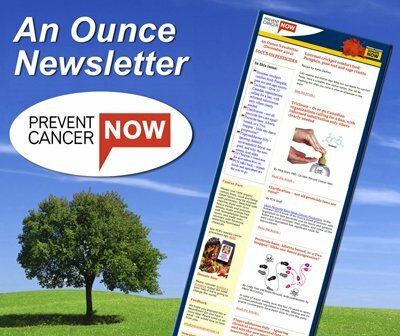 Minimize your cancer risk by eating the right type of food! Want to prevent cancer? Then lobby for democratic good government!